The collapse of geomaterials can greatly affect the normal working behaviour of geostructures and may even lead to catastrophic failure for a wide range of geostructures such as open-cut pits, underground mines, deep piles, tailings dams, building foundations, offshore rigs and deep wellbores. Collapse in geomaterials is usually accompanied by various forms of instability such as shear banding, bulging, diffused patterns and cracking. 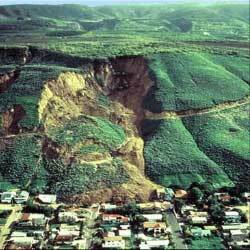 At large scale, it may present in a dramatic form such as a landslide. One important feature of these instability patterns is that they depend on the complex deformable microstructures of geomaterials such as microvoids, microcracks, soil particles, mineral crystals or polycrystals. The dimensions, physical properties, distributions and evolution of these microstructures predominantly determine the macroscopic mechanical response. To effectively model the collapse behaviour of geomaterials, the effects of the microstructures have to be fully considered. This project aims to develop to develop a multiscale modeling framework to efficiently consider the effect of microstructures on the overall structural response of the material body, and use it for simulating collapse problems in geomaterials and geotechnical engineering. Several scale quantities are treated in the modelling. The macro-scale deals with the engineering material body as a whole, which can be discretised into macroscopic finite elements. A mesoscale quantity denoted by a representative volume element (RVE) is assumed to be affixed to each material (Gauss integration) point in the elements. Each individual microstructure inside the RVE is treated as a microscale quantity. An important first step in multiscale modelling is to generate a packing of 3D microstructures in the RVE. 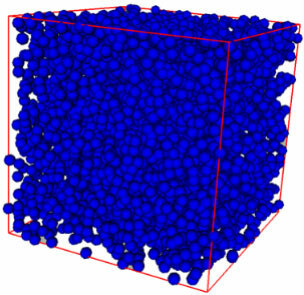 Depending on the specific material to be simulated, the shape of the microstructure varies. Soil particles, for example, can be modelled as spheres or ellipsoids. We employ a technique based on the Lubachevsky-Stillinger (L-S) algorithm for the packing. 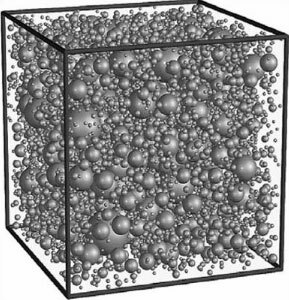 Image 2 shows an RVE assembly filled by 5000 mono-sized spheres. The grain size distribution in a real soil can be taken into account by generating a packing of soil particles with different sizes. By using a generalised geometric potential function in the following form, many other non-spherical superellipsoid shapes can be generated to better simulate the behaviour of real soil particles. The generated microstructure packing may be used to compute rolling and sliding on the microscale. On this scale, the effect of the microstructure governs so that conventional constitutive models do not apply. Novel strain gradient models are being developed to include intrinsic length scales in the constitutive relations. On the macroscale, conventional relations are used and implemented in the Newcastle finite element code SNAC. Energy-based averaging procedures are then developed to homogenise the microscopic quantities and obtain the macroscopic stresses and tangential stiffness (for both the elastic and plastic cases). Appropriate intrinsic length scales can be retained, even on the macroscale, so that important collapse phenomena such as size effects and localisation can be simulated. The resulting models and algorithms are being implemented in the displacement finite element code SNAC. As thousands of particles are involved in each RVE, the resultant system is computationally very demanding and parallel computation techniques are needed. The models developed will serve as an extremely robust tool for the simulation of collapse and failure of various geotechnical boundary value problems, and provide useful information for safe and cheaper design of geostructures. Figure 4. 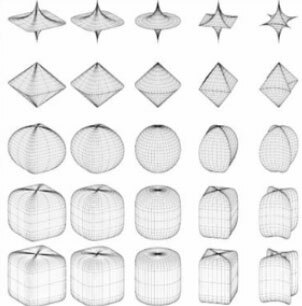 Superellipsoid shapes produced by using a generalised geometric potential function to better simulate the behaviour of real soil particles (the non-convex ones are usually avoided due to the computational complications they cause).